In remembrance of the assassination of President John F. Kennedy, alumni reflect on the parts they played to help shape history. UNT is taking part in the following events that are open to the public. For three UNT alumni, president's assassination was just one of many major events they covered. Two degrees from UNT gave the recently retired Dallas city manager a strong foundation. Extended questions and answers from alumnus Mary Suhm ('74 M.S., '84 M.B.A.). UNT combines undergraduate academic services under one roof for convenience and collaboration. Pat Guseman celebrates her parent's love for North Texas by supporting faculty excellence. A UNT education helps students rise to the top. The device can detect and analyze chemicals present on the nanoscale. Cody Sharp ('11) hopes to one day direct the digital retailing department for a major luxury brand. UNT's program, the first of its kind, is blazing the trail for consumers. Mean Green football kicks off first season in Conference USA and celebrates 100 years. This football season, alumni can socialize at the Alumni Association's pavilion at Apogee Stadium. Former UNT student Ivana Hall competes Sept. 15 for the Miss America title. Expanded facility will build on UNT's legacy as an environmentally friendly campus. 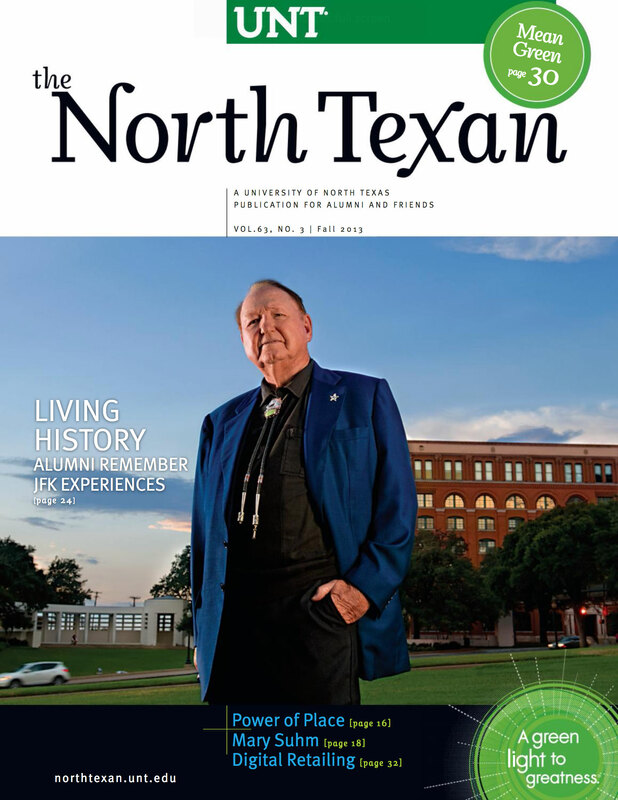 Now alumni and friends of the university can take part in Mean Green Fridays. Gabriella Draney ('02) is living proof that successful people aren't afraid to take chances. How can you make tailgating easy and fun? Five alumni and two faculty members were recognized for their visual art. Thirty-one of UNT's newest master's degree graduates live 7,000 miles away from Denton. Visitors to the Perot Museum in Dallas experienced UNT research up close this summer. UNT joins community partners to mentor 1,000 children in Denton schools. Jason Leap ('10), military veteran, will compete in the Simpson Cup to support injured vets. Caitlin McConnell ('10) adds sparkle for celebrity clients and a cause dear to her heart. Running through the genes of the Smith family is a love for science and math — and for UNT. The Cowboys Rhythm and Blue Dancers will sport a little green -- a UNT student and three alumnae. I will miss the presence that Dr./Brig. Gen. Hurley had on campus during my enrollment. I was happy to see the letter from former track and cross country members who are still running. I found this picture in my North Texas scrapbook. Not only am I an employee of UNT, but I am also part of the Dog Days of Denton. I attended a banquet at church this summer that had a '50s theme.